Kitchen & Bath Design-Build firm. Works at crafting plans to your needs. See our Before & After photos. Just look at our reviews; we're dedicated to delivering high-quality, elegant Kitchen, Bathroom and Whole-Home Renovations in the north DFW area! At William French, our focus is on communication, personal customer service, and doing what we say we will do! Our highest honor is the consistent flow of great reviews from our many happy clients! It’s no coincidence that we have won "Best of Houzz” for the past 3 years straight: 2016, 2017, & 2018! And while that makes us very happy, our real satisfaction comes from the dozens of customers who are relaxing in the beautiful living spaces we've handcrafted for them. Call today, and we'll get started delivering the living space you've been dreaming of! *Authorized UltraCraft Cabinetry Dealer* Kitchen Design Concepts is a full service kitchen design and remodeling company serving Dallas and the surrounding area. Our designers specialize in creating kitchen spaces with a distinctive look and functionality that reflects you and your family as well as how you live and use your kitchen. Let us use our custom approach to enhance the look and style for the heart of your home. Visit our website (www.KitchenDesignConcepts.com) or our Facebook page (www.facebook.com/KitchenDesignConcepts) for more information about our company and services. Design visions for the future with more than 19 years of experience...The Nielsen Collection specializes in kitchen and bath redesign with fresh, contemporary styling that will engage one’s imagination. Our passion leans toward clean, well appointed lines. We are an award winning design team, here to create a masterpiece for your next project. We focus on vision, specific requirements, and desires of our clients. We offer a team of skilled artisans to see your project through, from beginning to end. As a supplemental service we offer on-line design for those who just want a little direction to be sure their DIY project is just perfect. The Nielsen Collection can guide you through your new construction or renovation project, whether it is Contemporary, Transitional, Modern, Farm House Modern, or Eclectic. We look forward to creating your Masterpiece! We ensure the home reflects the personality of the owner. Customer service, accessibility, and quality results are utmost in our designer's mind. This commitment to excellence is why The Nielsen Collection is an award winning design team. SDG | Schlosser Design Group, LLC. SDG is a Dallas Area Interior Designer designing for busy professionals who desire a full-service solution. An award-winning interior design firm led by Cristie Schlosser, ASID, RID. SDG provides personal service with quality workmanship and products guiding our clients through design process. Authentic, Timeless and Unique solutions that meet your long-term needs. Helene Terry’s expertise in kitchens and bathrooms began in 1978 in her hometown of Knoxville, Tennessee and her projects have included award winning designs including a 48,000 sq. ft. French Chateau in Texas, a Manhattan residence, an 18,000 square foot premium appliance showroom in Dallas, and many fine residences over her thirty-eight years of practice. Upon moving to North Texas in 1982 she has been a valued resource for Interior Designers, Architects, General Contractors and home owners in assisting with the detailing of the heart of the home – the kitchen. As the principal of Helene’s Luxury Kitchens she uses the tools of unique space planning, her cabinetry and finish details to create award winning Kitchens. She is also a regional winner of the Sub-Zero-Wolf Design contest in 2006, 2008, 2016 and National winner of the ASKO design contest in 2008. Her kitchen won first place in the recent ASID Dallas Design Ovation competition in 2017. She has collaborated with many Interior Designers and their projects have captured other awards with ASID Dallas Design Ovation and ASID Texas Chapter Legacy of Design. Her dedication is also demonstrated by being a past board member of ASID Dallas Design Community, Past President and Board Chairman of the Dallas Executives Association and former member of the Kitchen Advisory Committee at The Art Institute of Dallas. She also volunteers at Thrive Women’s Clinic as well as through Reunion Church in downtown Dallas. Her work has been published in This Old House, LUXE, Kitchen and Bath Business, NKBA Profile, D-Home, Design Guide, Texas Home and Living, and Great American Kitchens magazines. She has a 28 year old daughter, Jennifer, who graduated from Texas A & M, is married and resides in Houston with her family. Helene’s hobbies include reading, theatre, relaxing with friends and travel. Design by Kimberly Vaughan is a Dallas based 5 year award winning residential interior designer. We are a professional full service interior design firm specializing in total solutions and construction for residential spaces with attention to detail, budget, and project management from a simple makeover to a complete renovation. We are dedicated to providing personalized designs that are functional, comfortable, lasting and practical creating designs for every economic plan to enhance your home. Working together we develop beautiful warm and inviting spaces. We establish a strategy that fits your lifestyle, providing designs to build your dream home. A great designer is defined by their knowledge and how well they listen. Our talent develops a unique design custom to your needs and desires. We strive for honesty and transparency. We provide a turn key solution for interior design and construction. From design to completion of construction and sign off of the punch list. We will help you express yourself with combinations of color, balance, form, functionality, texture and style. We specialize in creating or refreshing interiors with modern, traditional, eclectic and transitional design. We utilize affordable interior design elements blending your tastes with my skills and design vision. My experience will prevent costly mistakes as we manage our trusted partners, specialty vendors and suppliers. Interior designer from Montreal now living in Dallas bringing international and unique approaches to design to the Dallas area one home at a time! Born out of wanting to find a way to serve, FIRST and foremost, my clients' needs, Decor Muse takes a unique Trades Team approach for each and every project. Collectively we offer our clients an organic and more relaxed feeling throughout the design process resulting in a finer and more authentic space. I have all the teams required to complete any level of renovation or remodel. 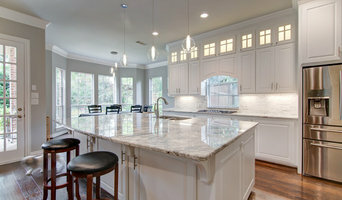 Redstone Kitchens was established in Dallas, Texas in 1984. We have completed hundreds of new kitchen projects for clients throughout the United States, Mexico, and the Caribbean. Our diverse staff is comprised of experts in the fields of fine arts, interior design, cabinetwork, carpentry, and home-building. All of our jobs are hand-drawn by Redstone draftsman and installed by a Redstone craftsman. The huge quantity and caliber of our success is a testament to our design and management skills. From multi-million dollar homes to galley kitchens in loft apartments, we are the best source for kitchen design, construction, and installation of fine cabinets, counter-tops, back-splashes, flooring and appliances to the single family and multi-family residential market. Our Cabinets: We are proud to be exclusive dealers of Downsview Kitchens. On display are kitchens ranging from ultra contemporary to old world traditional. All cabinets are completely custom built in any size, shape, color and wood species. They are designed and built to exact customer specifications. Our award-winning team of certified professional designers combines knowledge, innovation, experience and passion to effectively and eloquently translate clients’ desires into dream space transformations. Our designers know exactly what questions to ask to help determine the ideal functionality and aesthetics of your desired project. Our meticulous discovery process ensures that we deliver a comprehensive finished product that anticipates and responds to the needs of those using the space. Once your dream space is designed, our crew of master craftsmen and our customer care team work diligently to ensure that the transformation is delivered with exceptional service and impeccable quality. 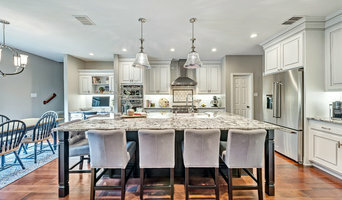 The Granite Shop has provided unmatched workmanship and skill required in presenting unique products to accent the homes in the DFW Metroplex for over 25 years.. We create everything from exotic kitchen counters, fireplace surrounds, medallions, bathroom vanities, tub decks and full slab showers. Our experienced stone experts will walk you through our unique process to ensure you find the stone that reflects your style. We directly import materials from all over the world in order to provide our customers with the highest quality stones at the most competitive prices. We specialize in granite, marble, quartzite, limestone, travertine, soapstone and many man-made materials. Design solutions to improve function and efficiency of your kitchen or bath. As a Kitchen and Bath Designer, my objective is to maximize the potential of your space by improving function and efficiency. I will save you money by providing you with the "blue-print" for your newly designed space, so that a contractor can effectively execute the design and avoid costly mistakes. TO THE TRADE Looking for Indoor/Outdoor furniture to update your space or items for your next project? Interior designer and trade sales. hotelier, Home stager, architect, developer, interior designer, realtor, hospitality designer, a novice or a furniture store business owner looking for quality commercial pieces for your indoor and outdoor space, Let me assist you. We can help you select pieces, options, to fit your space perfectly or the needs of your clients. We have access thousands of pieces in so many options and styles. Prices incomparable adding instant value. Comercial furniture one thing is the most important of all quality. That is why we work with you to find out where these pieces will be situated, what elements they will be exposed to, what type of atmosphere your trying to convey, who will be utilizing the space, and then we determine what metal, wicker, wood, poly-wood and fabric, finishes will suit the your needs. We have what your business and clients need when it comes to keeping you or your clients needs attended to and we are dedicated to making sure your getting the assurance and the best service on your next purchase. Some of the types of businesses/projects we have helped work include: • Home Staging for Home Resale (Statistics prove that staged homes sell faster and for more than non-staged homes) • Restaurant Dining Patio Furniture • Poolside Loungers and Daybeds dining sets, indoor/outdoor furniture for Hotels and Finer Residences • Outdoor/ indoor Seating for Restaurants, Hotels, and Office Spaces, condo rentals, apartment communities • Umbrellas for Outdoor Patio Areas, sofas, accessories, rugs, desks, office chairs, bar stools • Fire-pits and Fire tables, fire glass, and conversational sets for indoor and outdoor seating areas. For a response within 24 business hours, please email me @ Nikolas@ikdd.us or Nicholas@designandfunction4u.com Please give me a little info on your needs or inquiry. I can get started on getting you what you (or your clients) need to create an Indoor/ Outdoor space that is inviting, functional, stylish, and durable and of course at the best value. Or if you prefer, call me at 858-729-3277 and let me know how my self and the complies I represent can help meet your project and future needs. What does a The Colony kitchen designer or bathroom designer do? A kitchen and bath design professional in The Colony, TX knows to take all of these crucial points into consideration and can help plan the layout, materials and overall look and feel of either of these rooms in your home. Kitchen designers, as well as bathroom designers, are constantly staying on top of trends in the ever-changing industry. The designer also knows the best layout for your room, and can configure the layout for optimal functionality and utilization of the space. In the kitchen the refrigerator, stove and sink should be laid out in relation to one another, and it should be seamless and easy to move from one to the other. A The Colony kitchen and bath designer will know how to work with a contractor and architect to plan the flow of the room to work best for your needs. Here are some related professionals and vendors to complement the work of kitchen & bath designers: Kitchen & Bath Fixtures, Appliances, Tile, Stone & Countertops, Cabinets & Cabinetry, Woodworkers & Carpenters. Before you talk to bath and kitchen designers in The Colony, TX, consider how you will use the room. For your bathroom, is it necessary to have a bathtub for bathing kids or pets, or would a shower suffice? Perhaps all you need is a half bath for downstairs or a smaller guest bath for occasional use. Similarly, for kitchen renovations consider your cooking habits. Do you eat out every night but need a space to entertain in? If so, a smaller kitchen might be fine for you, with a space devoted to wine storage or a bar, whereas others might prefer a bigger stove or extra cabinets. When interviewing The Colony kitchen and bath designers, make sure to share these habits so they can best fit the room to suit your needs. Find a The Colony kitchen designer or bathroom designer on Houzz. Narrow your search in the Professionals section of the website to The Colony, TX kitchen and bath designers. You can also look through photos in The Colony, TX to find a kitchen or bathroom you like, then contact the professional who designed it.